Stories of former days in the long and distinguished record of the Ocean Wave Fire Company of Carleton Place, founded in 1875, are continued in this instalment. It recalls the years of the eighteen eighties, and this town’s perilous fire of 1910, in the times when steam fire engines and equipment were raced to the scene of action by galloping fire horses. Officers of the Ocean Wave Fire Company in the early eighteen eighties were William Patterson, captain; George Warren, first lieutenant; George Crawford, second lieutenant; John R. Galvin, secretary; William Rogers, treasurer; and John Flett, company engineer. The grants of the Carleton Place Council to the fire company at that time were $200 a year. The company usually had about 25 or 30 members; 35 was the membership attending its annual meeting in 1882. Leaders of the ld days subsequently included Tom Nagle, Dave Moffatt, Tom Lever, Jim Warren, Alex McLaren and the great Billy McIlquham. After the years of the hand pumpers, the purchase of a steam fire engine finally was authorized by an 1884 bylaw to raise $6,000 for this purpose. A brick fire hall, still standing, had been built on Bridge Street at the end of William Street. Several large tanks were situated at points distant from the river to serve as fire engine water reservoirs. The new fire engine was unable to save the inflammable new tannery and wool pulling plant of John F. Cram and Donald Munro, burned in 1886 with a fire loss of $10,000. Spectacular fire in the town of the nineties included the destruction of the Moffatt & Cavers shingle mill and most of the firm’s planning mill, and two losses of groups of Bridge Street retail shops. The plant and office of this newspaper, then named the Central Canadian and located at the corner of Bridge and Elgin Streets, were consumed by fire forty years ago. As in the country’s other larger towns and cities of fifty years ago, the pounding gallop to a Carleton Place fire by great teams of horses, drawing heavy brass-stacked fire engines belching their smoke and fire, and clanging and rattling hook and ladder wagons manned with firemen, brought a never to be forgotten wave of excitement to young and old alike. To youthful onlookers it was a latter-day Roman chariot race, in a vital and perhaps desperate cause. This town’s greatest fire came in mid May of 1910, and rode to its crescendo on the peak of a heavy gale. It came about the time predicted for the reappearance of Halley’s Comet. Some when half-awakening to its glare, thought they were viewing the light of the comet. Within four hours after midnight about thirty buildings were destroyed, most of them residences. Property losses in 1910 values were estimated at over $150,000. 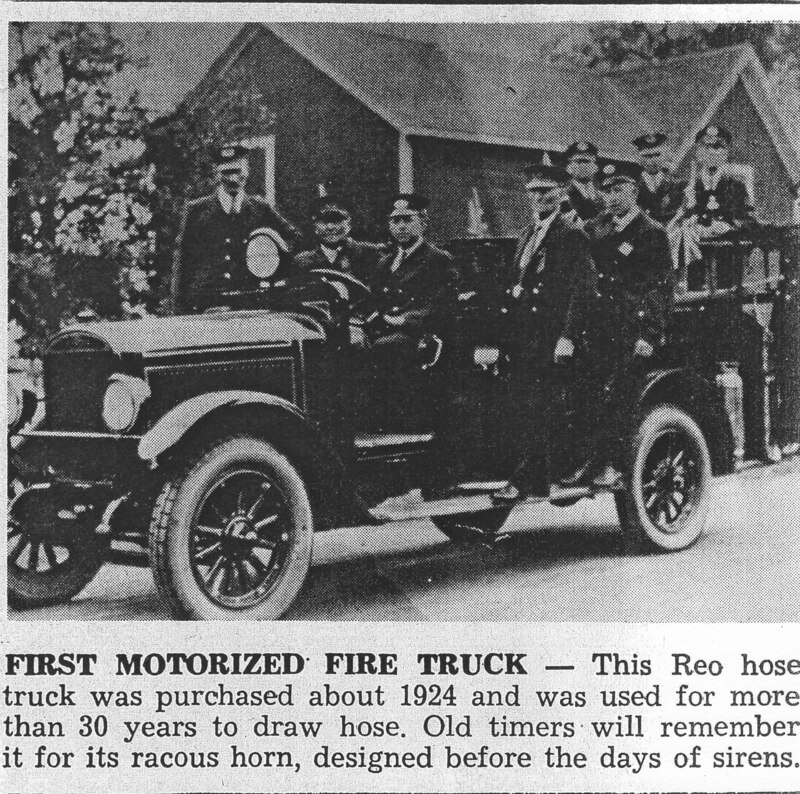 Through heroic work by the town fire department, the Canadian Pacific Railway fire force and Almonte firemen with their fire engine, aided by the courageous and frantic efforts of householders and others, a greater part of the south and east sides of the town was saved from equal devastation. The fire started on Bridge Street in a pair of retail stores at Albert Street, from a cause not known. Fanned by a high southwest wind it swept an area equaling about two blocks, centred in the Albert, Beckwith, Judson and Franklin Streets section. The block bounded by these four streets was reduced completely to ashes and ruin. Zion Presbyterian Church, valued at over $35,000 with its additions and renovations of the previous two years was wholly destroyed. Other public and church buildings bunred down, in addition to retail stores, were the curling rink, the militia drill shed, the Masonic Temple and St. Andrew’s and Zion church manses. A total loss at the residence of Mrs. James Gillies, on the site at Franklin and Judson Streets where fire had struck over thirty years earlier, was set at $18.000. For some time the fire illuminated the windswept night sky to an extent at which in Almonte and more distant points a newspaper could be read in its light. “The first water supply came from the new engine, which played two good streams from the bridge. The old fire engine also played two streams from the bridge but gave out early in the fight, the lift being too much for her. Two streams were laid from Brown’s, one from the pump at the light station and one from the grist mill. Another stream came from Mr. Nichols planning mill and still another from the Bates & Innes mill, to which the C.P.R. brigade attached their hose and held the fire from spreading across the tracks. Early in the night Mayor Albert Cram telephoned Almonte for aid. Our neighbour at great risk sent over their fire engine and a squad of men, the run being made over at a mile a minute rate by a locomotive and a flat car with Howard Moffatt at the throttle. The Almonte engine, was placed on Judson Street. As all the own hose were in service one of Brown’s pumps had to be cut off to give sufficient hose to the Almonte engine, which was placed below Brown’s mill. It did excellent service for some hours. Away over the track the tower of Bates & Innes mill took fire and was saved after a hard fight. Many houses on William Street were covered with embers, but the careful work of the owners prevented any outbreak. Half a mile further the granary and driveshed of Mr. Herbert Morphy took fire and was swept, the barns nearby being saved with difficulty. The firemen had a desperate fight with Zion Church manse. Here there would have been no hope for the wooden houses adjoining, and the Methodist parsonage and church and the Brown mills with dwellings would all have been in line. The uniforms and arms of the volunteers were removed from the drill shed, but some blank ammunition kept up a mournful fusillade when the fire reached it. The only thing standing in the block bounded by Beckwith, Albert, Judson and Franklin streets is a lattice-work in the rear of Mrs. Gillies home. Reminiscences of former generations of the men of the Ocean Wave Fire Company at work and in their lighter moments at play, as written about 50 years ago by the great, old sportsman W. J. ‘Baldy’ Welsh, will conclude the present group of stories of that memorable era of the town’s fire fighters. Within the lifetimes of our present elder citizens, telephones first came into public use in Carleton Place and nearby Ontario communities in 1885. Alexander Graham Bell’s invention of the telephone in this province in 1874 at Brantford was followed by convincing proofs of its commercial usefulness within two years in Ontario and Massachusetts. In Lanark County, only one year later, “one of Prof. Bell’s telephones” appeared in 1877. It was obtained by Mr. F. A. Kennedy, Perth dentist. With the sensational new devise he talked between his office and his house in Perth. At Ottawa the possibilities of the telephone were demonstrated by electrical pioneer Thomas Ahearn (1855-1938) in a talk in 18778 over telegraph wires with the Montreal Telegraph Company’s agent at Pembroke. The Bell Telephone Company of Canada, of which Mr. Ahearn was a director until his death, was formed in 1880. The company’s first published telephone directory for Lanark County subscribers was that for “Ottawa and Connections, June 1886.” Local and long distance calls were made by name instead of by telephone number. It listed seventeen Carleton Place telephones, all at business premises excepting the residence of the McLaren sawmill manager, and similar numbers of telephones at Almonte, Perth and Smiths Falls. Pakenham had ten telephones. The first Carleton Place exchange was located in the McDiarmid block, Bridge Street, in the jewelry store of Mr. R. J. E. Scott. This office was said in 1887 to be “owing to its central location, transacting next to the largest trunk line business in the Ottawa Valley.” The Canadian company at the beginning of that year had a total of twelve thousand telephone subscribers. Mr. W. J. Warwick, a year or so later succeeded Mr. Scott in the same location as a jeweler and as holder of the Bell Telephone Company’s local agency. An early private exchange in the town was that installed in 1890 by the H. Brown & Sons firm between its flour, feed and cereal mills and the offices and residences of its two senior partners (with the modern colour feature provided by receivers which were solidly ringed in gay colours). “Mr. Moss of the Central Telephone was brought into instantaneous action, and his first thought was to wing a message to Mr. McFadden at the Fire Hall, who was up and at the engine in a few minutes and, all alone, pushed the monster out upon the platform and applied the torch. The Chief and several others were aroused by Mr. Ross and the electrical alarm, which worked well. In a little while two streams were playing. As the Chief saw the fire was in a nest of wooden buildings, he had Mr. Brown’s splendid equipment brought out into the action, with five hundred feet of hose from the Gillies factory, hitherto unsoiled. While all this was proceeding, the occupants of the doomed buildings were getting out what they and the crowds could lay violent hands on. The firemen fought the flames with undying vigour. The hook and ladder was on the spot in five minutes, thanks to the speed of Mr. McGonigle, whose alarm went off early and who had a team hitched up and away in the twinkling of an eye. This apparatus was of inestimable value and one of the most agile and fearless in the contest was Mr. Mort. Brown, ‘the best fireman in Canada’, says Mr. Graham, who risked his life in climbing ladders and hurling the hooks. The firemen were soon coated with ice, and in this awkward condition worked with tireless energy, the branchmen especially doing brave and effective service. Towards daylight all danger of further inroads was over, but streams were poured steadily into the debris until noon. The engineer and Mr. Virtue stood steadily at their freezing posts on the river from three o’clock until noon, the noble engine old Sir John, not once stopped his powerful motion all that time. There were several narrow escapes. The most thrilling was that of Mr. Galloway, a Presbyterian clergyman who had preached the night before in the Methodist church and who was sleeping at Mr. McGregor’s. He is a cripple, and helpless in such a crisis. Mr. Howe, jeweler, and Mr. Hartley, book-keeper at the Shops, heard of his condition and rushed up after him. They grabbed him and carried him out, the roof falling in just as they left his room. The Bell Telephone Company’s present Carleton Place office, when twenty-nine years of ‘continuous service on Sundays’ had passed, was opened in its new building at the corner of Beckwith and Albert streets in January, 1929. The lot on which the building stands had been vacant since the great fire of May 1910, which swept this section of the town, destroying in its path the McNab home which is said to have stood at the precise site of the present building. There were some eight hundred town and rural telephones in direct connection with the exchange in 1928 when it was moved to its present location, and six operators.